Naohiro Goto was born in Hiroshima-Ken, Japan, on September 1, 1930. He received the B.E. 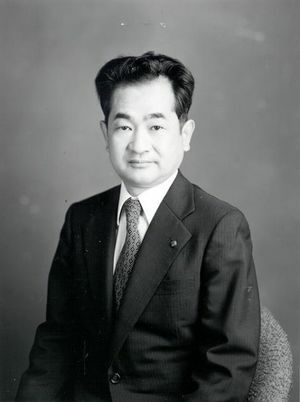 degree in electrical engineering from Tokyo Institute of Technology, Tokyo, Japan, in 1953. Mr. Goto started his career in NHK (Japan Broadcasting Corporation) in 1953. After four year's experience in field services at Tokushima Station, he was moved to Telecine Division of Tokyo Technical Operation Center where he was engaged in operations of television pickup devices such as iconoscopes, vidicons, and spot scanners. In 1961 he joined Electron Tube Research Division of Technical Research Laboratories, and this is the first step of his work in photoconductive television pickup tubes. His investigations in vidicon lag and theoretical study of photoconductivity led him to the initiation of developmental works since 1965 of pickup tube with target material of Selenium family. In 1966 a joint research program for the development of photoconductive pickup tubes was established between NHK Technical Research Laboratories and Central Research Laboratory of Hitachi Ltd. The Committee for this project has been continued since then, and Mr. Goto has been the most important member of the Committee. As the result of the joint research program, Saticon has been successfully developed as the broadcast-grade pickup tube. Since 1968 he has been a Senior Research Engineer of the Laboratories and he is working as the leader of the photoconductive pickup tube research group. Mr. Goto has been awarded with the following honors for his achievements in the development of Saticon: Special Award by President of NHK, 1974, Hōsōbunka Foundation Prize, 1977, Niwa-Takayanagi Prize, Achievement Prize of the Institute of Television Engineers of Japan, 1977, the Okochi Memorial Prize, Grand Production Prize, 1978 and the National Award for Inventors, Award by Minister of State for Science and Technology, 1979, and the 1983 IEEE Vladimir K. Zworykin Award "For the development of the photosensitive structure of the SATICON TV camera tube." Mr. Goto is a member of the Institute of Television Engineers of Japan and has contributed to the Institute as a managing secretary of the Professional Group of Electron Devices for four years since 1973. Mr. Goto resides in Tokyo with his wife, Toshiko, a daughter and a son. He is very much interested in playing "Go" and has been the No. 1 player in NHK for more than 20 years. He finds great relaxation in nature and enjoys angling on the seashore.